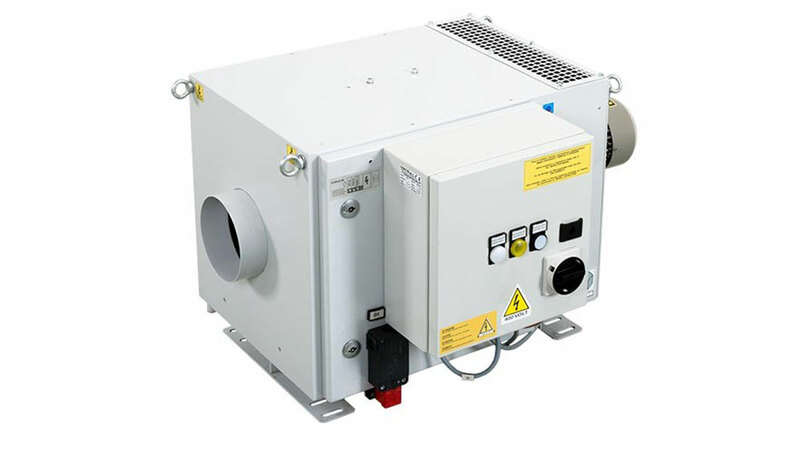 Icarus-E is an electrostatic filter for filtration of air containing oil mists, micro – mists, vapors and smokes generated by removal machining, especially those using neat oil; also it is design to be assembled to the machine tools. Access to filtering section is very easy and quick, you don’t need to unscrew or dismantle any part. Just open the two locks on the door and access to the filters, which can be extracted easily and changed in a few minutes. 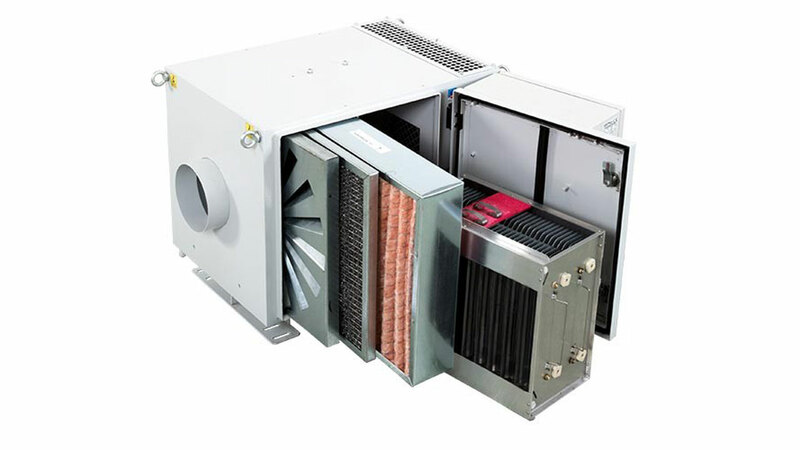 Using centrifugal fans with high efficiency grants high performances for flowrate and pressure, together with reduced power consumption and limited energy usage. Icarus also has very low noise emission. 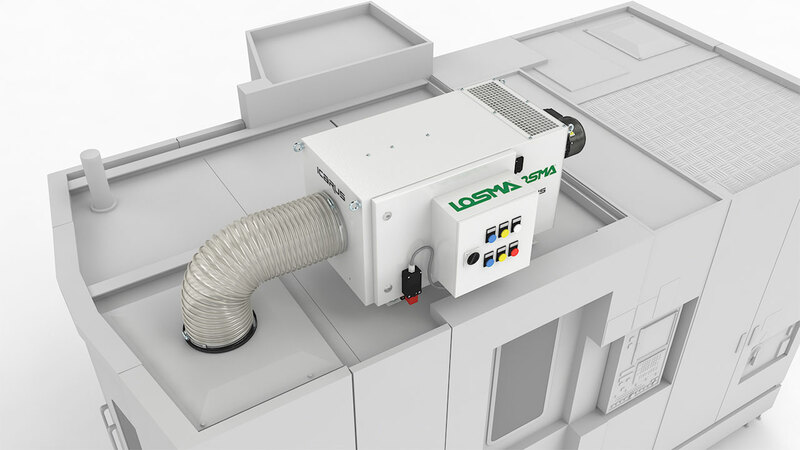 It’s available in three sizes from 600 to 1.700 m3/h with different increasing filtering efficiency combinations, up to 99,97% (with the use of HEPA H13 final filter). 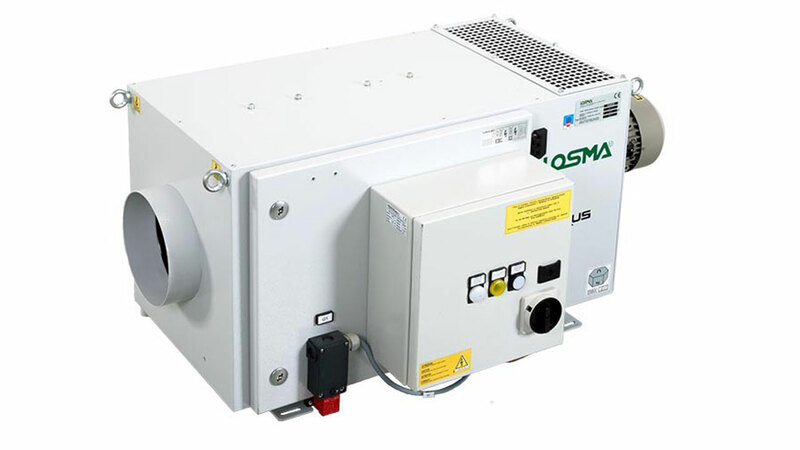 Standard equipment of the system is made by an electrical control box, “CE” regulation compliant, including an obstruction alarm, power alarm and micro-switch for safety. 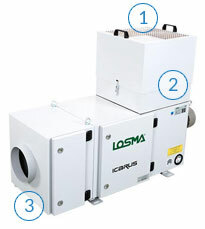 Polluted air is drawn in by a high efficiency centrifugal fan (A), mounted behind the filters. 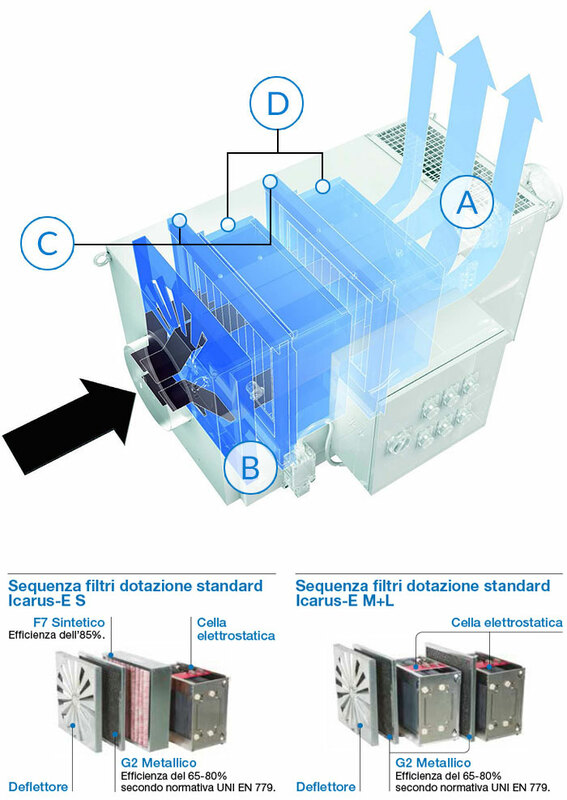 In this way the fan cannot be damaged, since it works with clean air without any pollutant residual. Air passes initially through a special deflector (B), whose function is to distribute uniformly the air onto filter’s and cell’s surface. After passing through the metallic pre-filter (restorable) (C) air passes through the ionizing section of cells (D), charging electrostatically, and passing then into the collector section composed by many aluminium foils, which holds firmly also the finest particles. 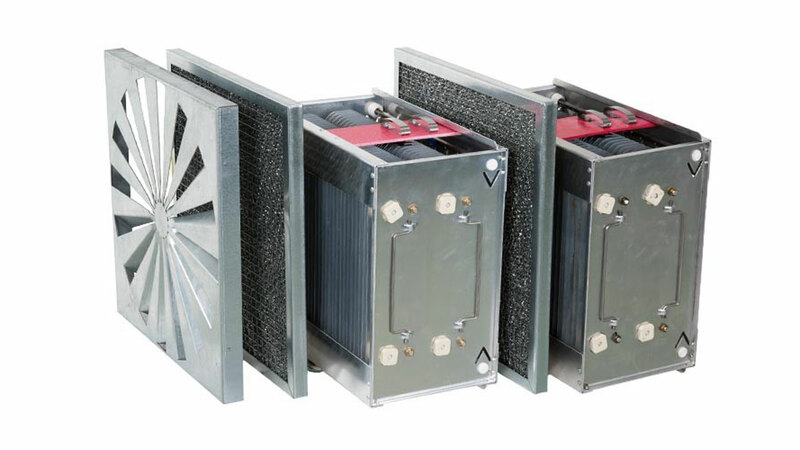 Provides a very high filtration efficiency, up to 99,97%, following the EN 1822 regulation. Useful in case of micro-mists and smokes. Pre-filtration module for swarf and dust, working through metallic and synthetic filtration stages. 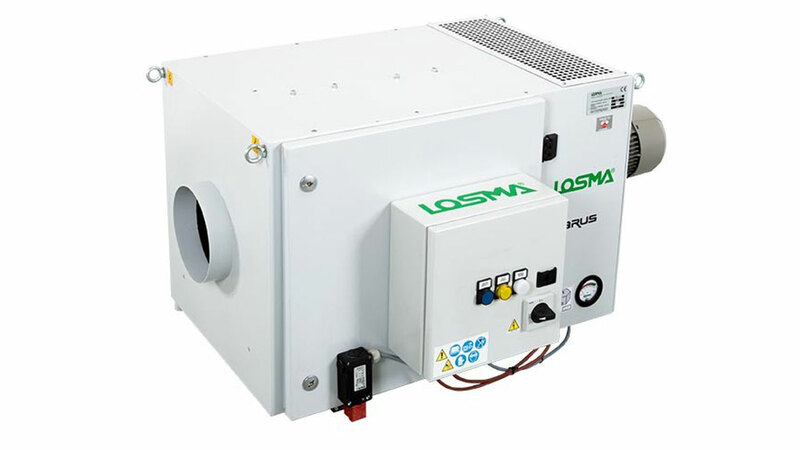 Useful to optimize the air suction efficiency in case of high production of oil mists containing dusts and metallic swarf.